​As we all know, different vehicles dome equipped with different bolt patterns. Therefore, it is absolutely important to know how to measure rim bolt pattern so that you can replace wheels on your car. However, most of the people actually don’t know the measurements when it comes to rim bolt pattern. This will affect their choice of wheels for sure​ and, that can sometimes be a bad thing since the wheels will not fit. Anyhow, we are here to discuss everything that you need to know in order to learn how to measure ​bolt pattern for rims properly. Now, let’s begin with the important stuff. What ​Is the Rim Bolt Pattern? First of all, let’s say a few things about the rim bolt pattern in general. Namely, the rim bolt pattern actually is an imaginary circle that is created from the center of the lugs on your wheel. Usually, there are 4 or 5 lug holes on the wheels of your car, but, you can sometimes find even 6 or 8 lugs on your wheels. This depends on the model of the car and the manufacturer specifications that your car has. Also, it doesn’t have to mean that your wheels are more secured if you have more lugs on them. Sometimes only 4 lugs are quite enough to provide security and stability for your wheels. Now, the rim bolt pattern is usually expressed with two-number system. Simply speaking, the first number in this system refers to the number of holes that your wheel actually have. On the other hand, the second number indicates the diameter of the circle that these holes form. 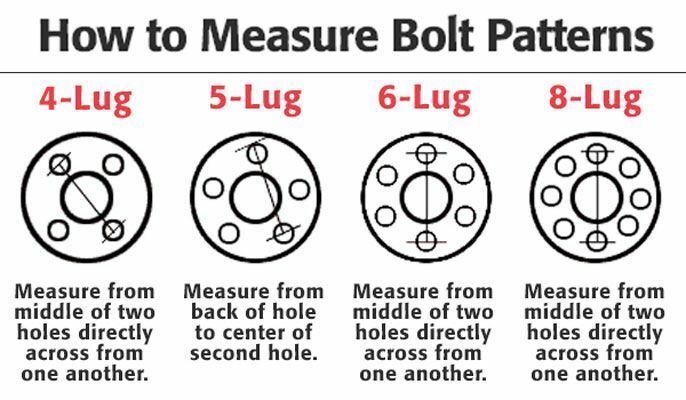 To clear things up a little bit, if you come across a bolt pattern ‘’4 x 100’’, that means that your wheel has 4 holes and that the diameter of the circle is 100mm. Now, with this thing being said, let’s see how ​to measure bolt pattern on rim properly. Since there are different types of wheels with different number of lugs, we are going to divide this section into four different parts. Anyhow, you can see the measurement pattern here. 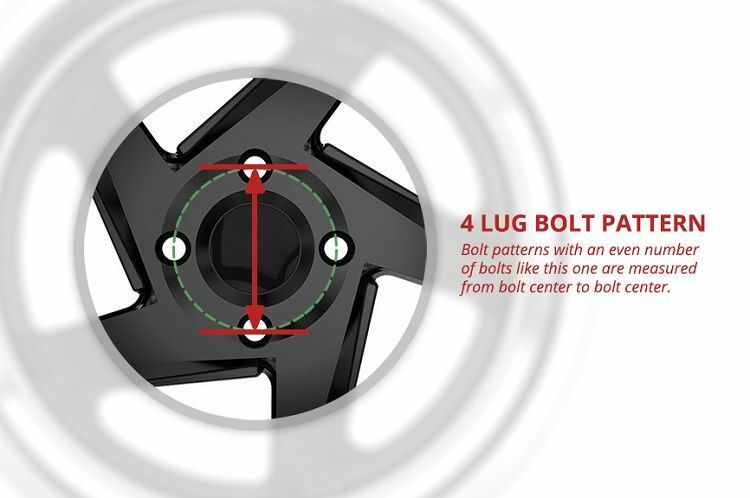 ​As the picture shows, the bolt pattern on wheels with 4 lugs is quite easy to understand. 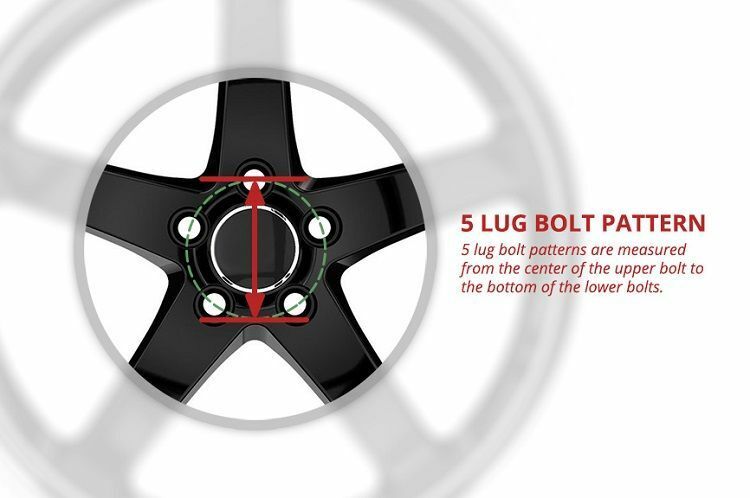 Namely, 4 lugs wheels have four holes that are symmetrical, therefore, measuring the bolt pattern is not a hard thing to do. All you need to do in order to measure precisely is to start from the midpoint of one circle. Next, you need to ‘’draw a line’’ to the opposite circle to the center point as well. This will precisely show you the number of the diameter that you need to know in order to get the right wheel for your car. Now, measuring the 5 bolt rim is not that easy as 4 bolt rim. Since there are 5 bolts equipped on the wheel, it can be a little bit confusing to some people how to measure precisely. Simply speaking, the holes are not placed directly opposite of one another in this patter, and therefore, you need to know the proper way of measuring this type of rim. Anyhow, some of the most experienced men in this field came up with the variety of solutions that can allow you to measure 5 bolt rims properly. You need to guess where the directly opposite hole would be placed. After you correctly determined the correct place of the ‘’imaginary’’ hole, you can measure from the center of the circle up to the center of the ‘’imaginary’’ circle. This basically is the same way of measuring as it would be if there were only 4 holes. However, this method is a little bit tricky since you can’t always be sure to determine the exact location of the ‘’imaginary’’ circle. The method number two is way more reliable and definitely a little bit easier to do. Namely, you need to start measuring from the center of one circle and end up to the farthest edge of any circle that is not right next to the first circle. As we said, this solution is way more reliable and you probably will ensure that the measurements are correct by using this method. The last method is also a little bit complicated, but definitely doable. First, you need to measure from the center of one circle up to the center of the circle that is right next to the first circle. 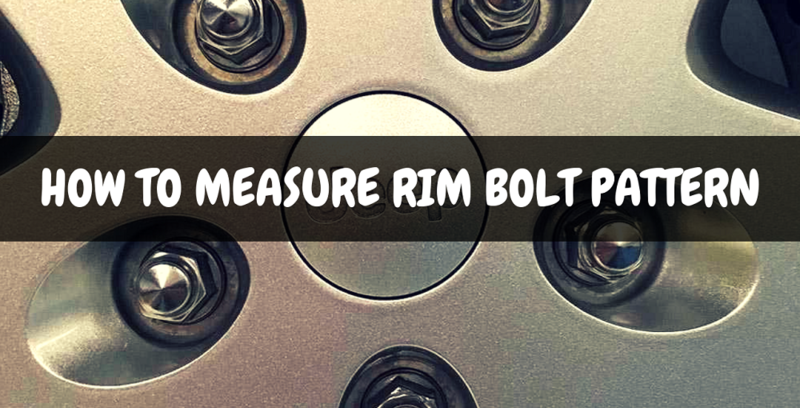 You won’t need any special tools for this type of measurement, but, you will need a chart that tells you the exact diameter of that rim bolt pattern. This chart will provide the precise measuring, but, you have to do a little bit of math. 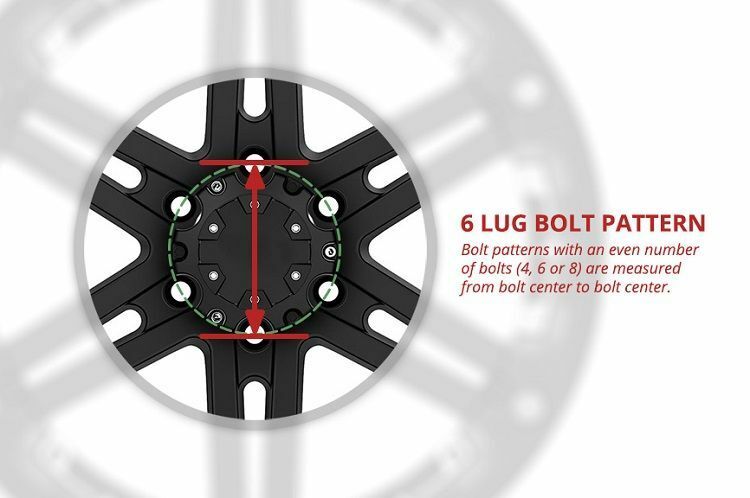 When it comes to 6 bolt rim, the measurement process is also easy. It basically goes the same as the 4 bolt rim. So, you have to measure from the center of one hole and end up to the center of the opposite hole. You can choose basically any hole to start with, but, you have to end up in the center of the opposite hole. Measuring the bolt pattern on the 8 bolt rim is also piece of cake. Namely, you can repeat the process that we describes in the ‘’6 bolt measuring’’. However, the same rule applies here as well. You need to start with the center of one hole and end up in the center of the opposite hole. In the light of everything we said above, you can clearly see that measuring of rim bolt pattern is not that hard to do, especially if you have the right kind of knowledge that can make it easier. Also, it doesn’t matter how many bolts your rim have, we described every possible rim bolt pattern measuring process. All in all, it is only up to you now to apply the information from this article and get your measurements properly.